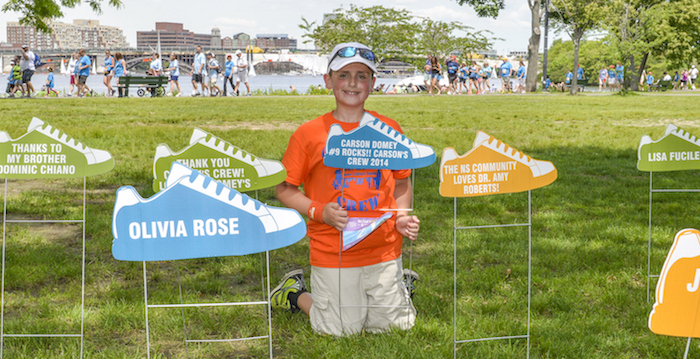 The 13th Annual Fundraising Walk will take place at DCR’s Baxter Park, Assembly Row in Somerville on June 14, 2015. Last year’s Walk had over 5,200 walkers and raised over $1.6 million to support the hospital. The goal this year is $1.8 million. Boston Children’s Hospital is encouraging all who are interested in spending the day at Assembly Row and walking for the hospital to register for the 2- and 7-mile walks online at www.bostonchildrens.org/walk. Cookout with your fellow Walkers at the food tent where hamburgers, hot dogs and other grilled items are provided, in addition to snacks and drinks along the walk route. Craft and decorate crowns, backpacks, bandanas and other Walk gear at the kids activities tent. Have you face painted because there’s no better way to show team spirit. Hop into the Bubble Station, complete with multiple kiddie pools and bubble wands. Dance to the live music of Ben Rudnick & Friends. Their musical style blends bluegrass, rock and New Orleans with fun covers of familiar tunes. Don’t forget the treats provided by walk sponsors. Each sponsor has a tent on the event field where they will pass out surprise items to walkers like reusable totes, sunglasses, noisemakers, cowbells, etc. After the Walk, shop around the Assembly Row outlets, see a movie at the AMC Assembly Row 12, discover Legoland, or grab a bite to eat at one of the 12 Assembly Row eateries. Walkers can register for the 2- and 7-mile walks online at www.bostonchildrens.org/walk. Registration is $25 for adults; $5 for children 12 and under. Each adult walker is expected to raise at least $200. Supporters can also make donations at www.bostonchildrens.org/walk.